At Elmhurst Toyota we love a good auto show. Even if we can’t get to all of them, we enjoy reading about all the new cars and trucks Toyota is promoting. After getting the news of these new arrivals we eagerly await their arrival on our lot. That certainly was the case for the new Toyota RAV4 when it was introduced to the world at the New York auto show early this year. The Toyota RAV4 model was touted as a smart, fun, stylish and efficient sports utility vehicle with plenty of great tech features. It is definitely all those things with a hybrid powertrain that improved on the RAV4’s get up and go and the on demand all wheel drive. The gas powered version features a 2.5 liter four cylinder engine paired with a six speed automatic to deliver 176 horsepower. The hybrid version’s 2.5 liter utilizes a single-speed transmission and two electric motors to deliver 194 horsepower and 206 lb-ft of torque. Standard on the LE are 17-inch steel wheels, a 6.1-inch touch screen for infotainment functions, Bluetooth and USB connectivity, voice recognition, and the usual power accessories. Trailer sway control, hill-hold assist, and a brake-based limited-slip functionality (which, when engaged under 25 mph, doesn’t cut the throttle) also are standard. The RAV4 Hybrid will be available in the XLE and Limited trims only. 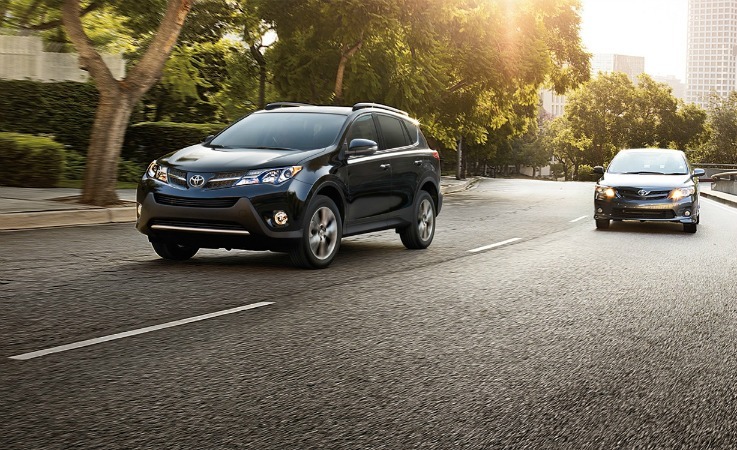 The RAV4 is expected to get 24 miles to the gallon in the city and 31 mpg on the highway. The XLE and Limited trim levels come with 17 inch wheels and interior feature that include a 4.2 inch TFT info and an around-view monitor. The Limited trim level features the Toyota Safe Sense safety package which included auto braking, adaptive cruise control, lane-departure warning, pedestrian detection. Heated from seats and a push button start are some of the little things that count. To find out more information about the new RAV4 model, or any model of Toyota car or truck, come visit us and talk to one of our friendly sales people here at Elmhurst Toyota. We are located at 440 W. Lake Street in Elmhurst, IL.